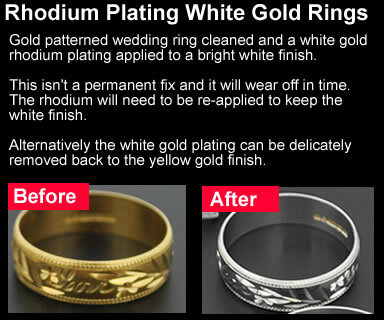 White Gold Rhodium Plating Service on special offer now £14.99 – available instore and by post (p&p charges apply). Convert yellow gold rings to white gold. This entry was posted on Wednesday, July 3rd, 2013 at 1:00 pm	and tagged with jewellery, rhodium, rhodium plating, rhodium ring, ring, special offer, white gold rhodium, yellow gold ring and posted in Jewellery Repair. You can follow any responses to this entry through the RSS 2.0 feed. « It is the start of the school holidays and that means its a busy time for ear piercing.